Back in October 2016 we had the pleasure of visiting and touring the old historic Cornwall Iron Furnace property and museum. You can read our original and thorough review of this historic place by visiting our previous blog post, located HERE. A few days ago I was trimming down a slew of photographs that we've saved over the past three years while traveling around the great state of Pennsylvania and came across some additional photographs that we took during our visit to Cornwall Iron Furnace that are worthy of sharing with you. Just briefly, Cornwall Iron Furnace is located in Cornwall Pennsylvania and was one of the biggest iron producing factories east of the Mississippi River. It operated as a profitable business from 1742 to 1883 producing iron for such things as artillery, wagon wheels, horse shoes, skillets, cooking vessels, etc. It's the only surviving intact charcoal cold blast furnace in the western hemisphere. It's a typical old-time iron furnace, one of many that used to dot the Pennsylvania countryside in the 18th and 19th centuries. Once the plant was in full operation, many homes, artisans' shops, stores, schools, churches, and the home of the wealthy iron master were built around it. Cornwall Iron Furnace was once a thriving and self-sufficient village all on it's own. Iron ore, limestone, and wood for charcoal were found in this self-contained iron plantation, totally about 10,000 acres in size. When the plant was in full operation, it would employ 50-75 employees at a time who were all skilled tradesmen and lived on the property, along with their families. The employees & their families didn't need to leave the village for anything because all medical care, religious needs, groceries, etc. were all provided on-site to them. If you love old-world Gothic Architecture, you'll love touring this old historical building. One of the things I loved about it's Gothic architecture was those glorious old windows! As you walk through the old furnace, you'll realize how dark and dreary the place is with the lack of lighting they had back then. Another thing I enjoyed looking at was the old reproduction lighting fixtures that hang on the wall and from the ceiling. You can see all of this via my two photographs above. I can't even imagine working in such a dark & dreary place! 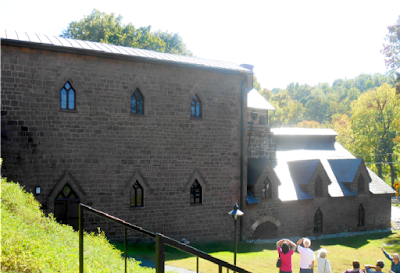 As you take the guided tour through the old Cornwall Iron Furnace building, you'll be walking through three different floors...starting at the top of the building and working your way down. I do suggest that you wear comfortable walking shoes and if you're visiting during the cold season, you may want to wear a jacket or sweater. During the hot summer season, it does indeed get hot in there. To learn more about it's importance in American history, you can visit our original blog post that we published late last year on our visit to Cornwall Iron Furnace. All photos in this travel feature are clickable. You can click on each one and it will automatically open up in a new browsing window and in an enlarged size.